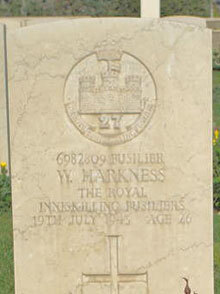 Fusilier William J. Harkness was the son of William Harkness and Susan Harkness (nee Harrison) of Killycolp, Tullyhogue, Cookstown, and husband of Mary J. Harkness, Coalisland, Co. Tyrone. 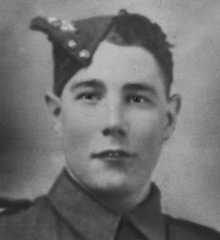 Fusilier William Harkness was killed in action at the Battle of Lemon Bridge, Sicily on 19th July 1943, in the same action that took the life of Fusilier Robert Gildea. Catania War Cemetery is 7 kilometres south-west of Catania. From Catania Airport follow the tangenziale (main road) towards the A19 (in the direction of Palermo). Before reaching the A19 the cemetery is signposted. Cemetery address: Stradale Passo del Fico - 95121 Catania Zona Industriale (CT) Sicily.